The 1967 swan (goose) pattern dollar is being faked. Chinese counterfeit coins are flooding the market so if you are looking to buy one of these coins then read on. A genuine goose or swan pattern dollar is a true collector piece and these are eagerly sought by coin collectors -even though they are not legal tender. Just 1,500 milled edge uncirculated goose dollars were struck by John Pinches medallists of London. Read more about the history of the 1967 ACR Pattern Swan Dollar (Goose Dollar) by Andor Meszaros. Genuine examples usually sell for $1,000-$4,000 so if you see a bargain goose dollar then the chances are it’s too good to be true. Let’s discuss how to pick one of these Chinese fakes over the genuine example. Below you can see comparison images, the genuine coin on top and the fake below. This genuine example is in a PCGS slab which is always a great way to identify that a coin or medal is genuine. 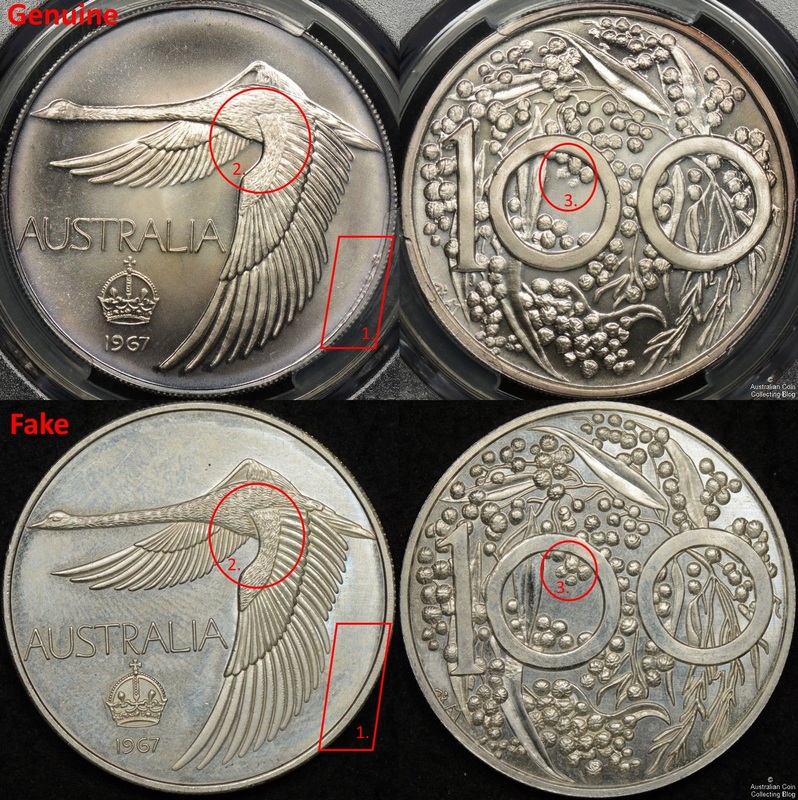 Looking closely at the design we can easily identify the counterfeit coin. The most obvious mistake is the omission of the designers initials on the swan side of the coin1. The next detail to look at is the feathers on the swan which are too well-defined on the fake in comparison to the genuine coin2. Another point to make is inside the first 0 (of 100) two of the wattle flowers are too prominent on the counterfeit3. Overall though these fakes are quite good and if you don’t know what to look for then you could easily find yourself purchasing a dud. Buyer beware.